American cinema has been saturated with superhero product since the turn of the millennium and in a decade's time, franchises have come, gone and been rebooted. Despite the superhero infoglut, the world's most recognizable superhero has remained absent from the stage. 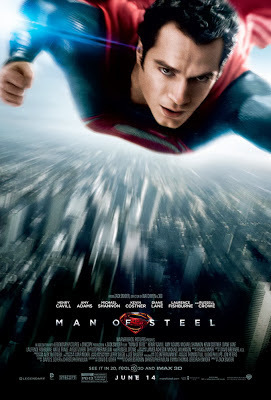 Superman is the hero in question, and his last film, 2006's Superman Returns, was tepidly received. Any possibility for a follow up fizzled out. 2013's Man of Steel then is a page one reboot and attempts to forget the mistakes of the past. It's a sprawling film with a dense mythology and plenty of room sequels, spin-offs and tie-ins. So expansive is the film’s scope, it probably could have been split into a two- or three-film story arc. Man of Steel chronicles the first 33 years of Superman's life (Kal-El is his alien name) and largely succeeds. Man of Steel opens to a lengthy prolog on Kyrpton, Superman's home planet. Kyrptonian society is in decline, and Kal-El is born on the eve of his planet's destruction. Kyrpton's resources have been exhausted, and the power hungry General Zod (Michael Shannon) attempts a coup of the current regime. In the chaos, Superman's birth father Jor-El (Russell Crowe) sends his son to Earth as a refugee. Flash forward (and sometimes backward) to a young Clark Kent (Henry Cavill) who is having trouble fitting in with his human peers. Superman's adoptive parents, Jonathan and Martha Kent (Kevin Costner and Diane Lane) have always taught Clark to hide his powers, out of the fear it may cause global panic. When the discovery of Kyrptonian spacecraft by the US Military leads to the arrival of General Zod, Superman may no longer be able to hide his true heritage. Additional characters include Lois Lane (Amy Adams), an intrepid reporter on Clark's trail; Perry White (Laurence Fishburne) her editor; US Military personnel (Christopher Meloni); and Faora (Antje Traue), Zod's sidekick. Plot points include natural disasters, space creatures, military skirmishes, top secret information leaks, Christian symbolism, schoolyard bullies, and even a little romance. If Man of Steel had only included a car chase and musical number, it may have contained elements of every genre ever invented. With a two and a half hour runtime and a myriad of characters, motives and plotlines, it's something of a minor miracle that Man of Steel is coherent at all. Though comic book and sci-fi fans may enjoy the serious treatment of the source material, casual moviegoers may be off put by the film's deep mythology and somber tone. There is little humor to be found here, and Kryptonian society is depicted with the same level of detail one would expect in high fantasy. The showdown between Superman and Zod in the film's final act is nothing short of relentless. Punches, explosions, spaceships and machine guns are flashed on screen so quickly the action becomes abstract. Human casualties and municipal damage cease to have any meaning as the fight goes on for several reels of film. Even with the film's flaws, director Zack Snyder is in control of his material here, and the film's scope is nothing short of impressive. Man of Steel shows marked improvement over the muddled storytelling in Sucker Punch, Snyder's previous film. Man of Steel was written by David S. Goyer, Hollywood's go-to guy for comic book movies. Goyer has worked of franchises such as Batman, Blade and Ghost Rider. Christopher Nolan, director of the Christian Bale era Batman films, gets a "story by" nod, and his presence may help explain this film's somber tone. Superman was created by Jerry Siegel and Joe Shuster. Man of Steel is a complex and impressive film. Though casual fans may be off put by the film's dense mythology and narrative, comic book and sci-fi geeks have much to celebrate in the serious treatment of an icon. By no means perfect, it certainly is a grandiose way to kick of a franchise.